In Treasury Secretary Parkinson’s post budget speech to the ABE, there is a flight of carbon-price fancy that made me laugh out loud — the justification for the budget assumption that the price will move so that prior emission targets are met. There is a market, you know — how about looking at the forwards? The previous projections were based on the Strong growth, low pollution report published in 2011, which is a comprehensive modelling exercise underpinned by longer-term fundamentals such as the long-term global environmental goals. These fundamentals haven’t changed. As such, the modelled prices continue to show the price levels required over time to meet these long-term goals as well as the international commitments to reduce emissions by 2020. 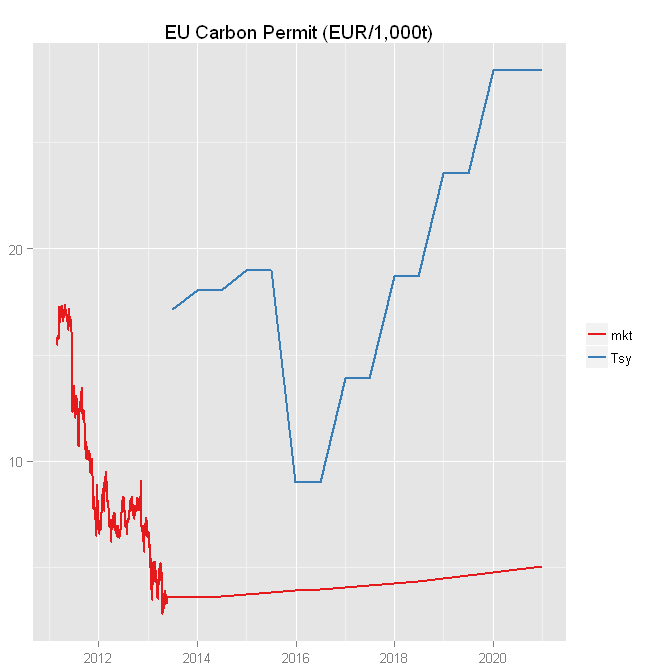 However, in the near term, the profound economic weakness in Europe has weighed heavily on the European carbon market. As the Australian carbon pricing mechanism will be linking to the European ETS from 2015-16, downward revisions to price projections largely reflect this weakness. This fall in the carbon price will mean that it will be cheaper for the Australian economy to achieve its emissions reduction target. Of course, Dr Parkinson knows what happened to the European Carbon Permit market — politicians faced a choice between growth and ecology and chose growth. They granted permits because taxing heavy industry during a deep recession would have been more unpopular than granting permits. The ‘environment’ is a luxury good – most people care more about paying their mortgage, and looking after their own kids. Of course, that means that they are likely to continue to over-issue permits in the future — which is why carbon permit forwads remain depressed. This entry was posted in AUD, Australian Politics, economics. Bookmark the permalink. Agree – its stupid and shows how politicised they’ve become. But on the flip side, if the market is the most unbiased forecaster, why assume the ToT will revert towards the long term average? There are not 20yr forwards for iron ore … But fair point. I would say you ought to shade your assumptions for the downside. That’s prudence.